Proyecto PERCEBES-BiodivERsA Construcción-Instalación from DocumentAzul on Vimeo. Employees at the El Vasco workshop did a carefull folding and welding job to produce metal cages cages capable of withstanding tremendous wave forces. 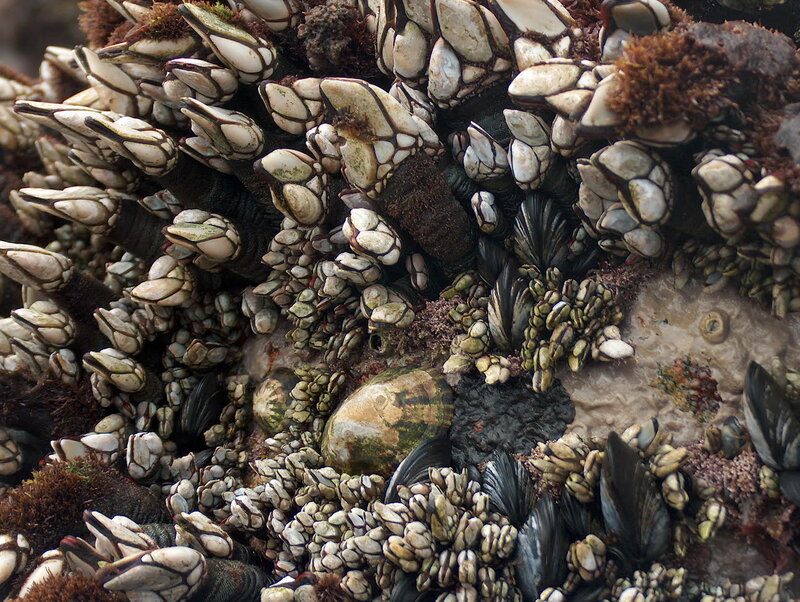 These conditions are typical of the sites where the stalked barnacles live. 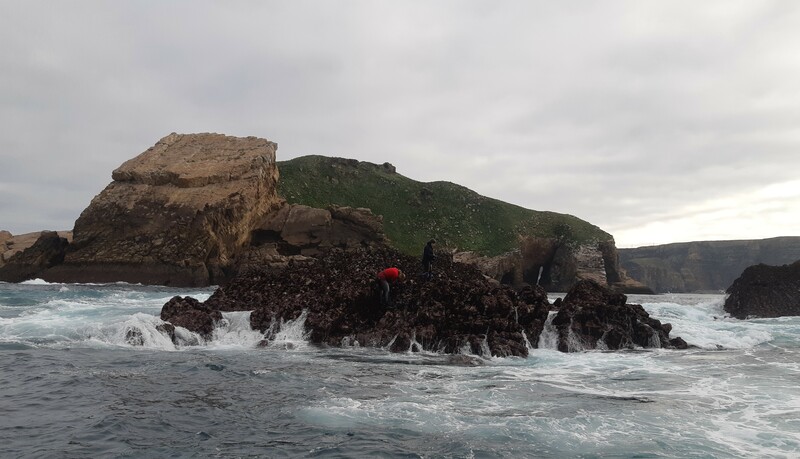 Almost 2 years after initiation of the PERCEBES human exclusion experiment, the cages have fared well and remain attached to the rocks. Los trabajadores del taller El Vasco hicieron un cuidadoso trabajo de plegado y soldadura para fabricar jaulas de metal capaces de soportar la fuerza del oleaje. Estas condiciones son típicas de los sitios donde viven los percebes. Casi 2 años después del inicio del experimento de exclusión humana PERCEBES, las jaulas han ido bien y siguen unidas a las rocas. The ultimate goal of research projects related to fisheries management such as PERCEBES is to produce evidence that can be used by decision makers in policies. However, policy making is a complex task influenced by many factors and often the amount of scientific evidence when decisions are made is scarce. 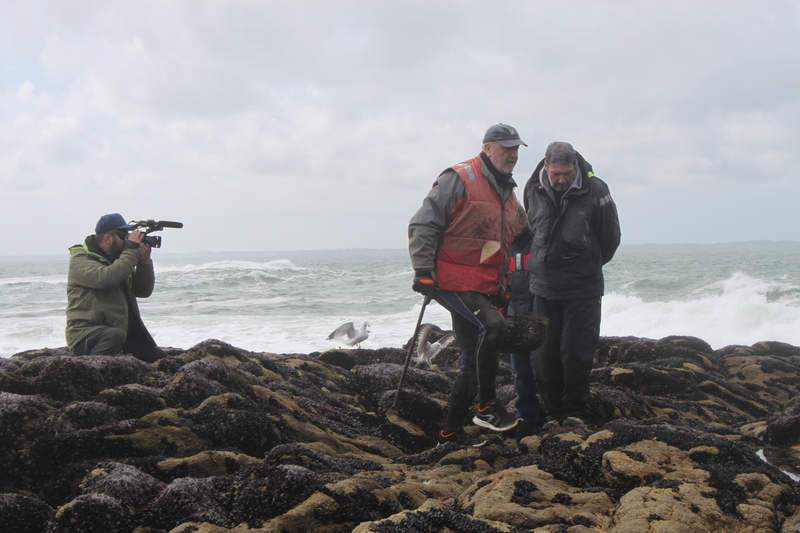 As a way to promote an effective interaction between research and practice, PERCEBES is planning a meeting for February 2020 to engage stakeholders of the barnacle fishery across Europe. The meeting will be held in Asturias. Fishers, scientists and governmental officers from France, Portugal and Spain will meet to facilitate the transfer of knowledge from ones to others and discuss the findings gathered by the project since it was launched in 2017. 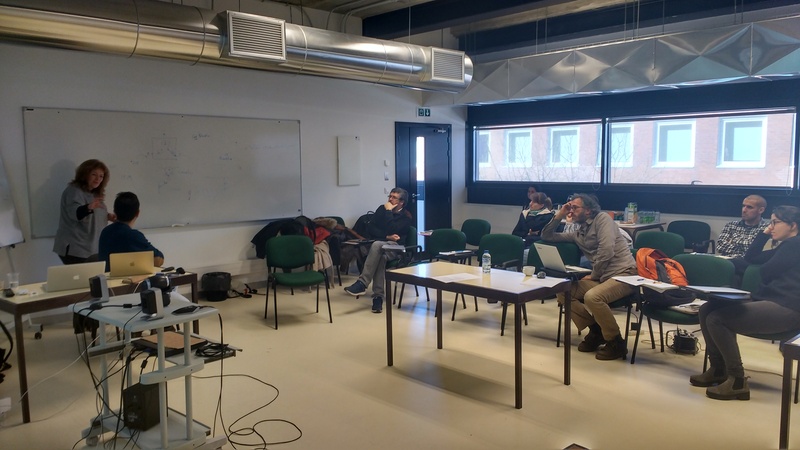 To plan the meeting, Alba Aguión and other researchers from the University of Vigo (EcoCost lab) and José Luis Acuña and Katja Geiger from the University of Oviedo (coordinators of the project) met last Friday at the ECIMAT. Researchers counted on the useful advice from Beti Nieto, José Luis García and Raúl González from WWF, who have extensive experience in the organization of engaging meetings for stakeholders, And Jorge Navacerrada, from the facilitation company ALTEKIO. Jorge Cachero from DOCUMENTAZUL also participated in the discussion, as the producer of the video documentary currently being prepared for the project. 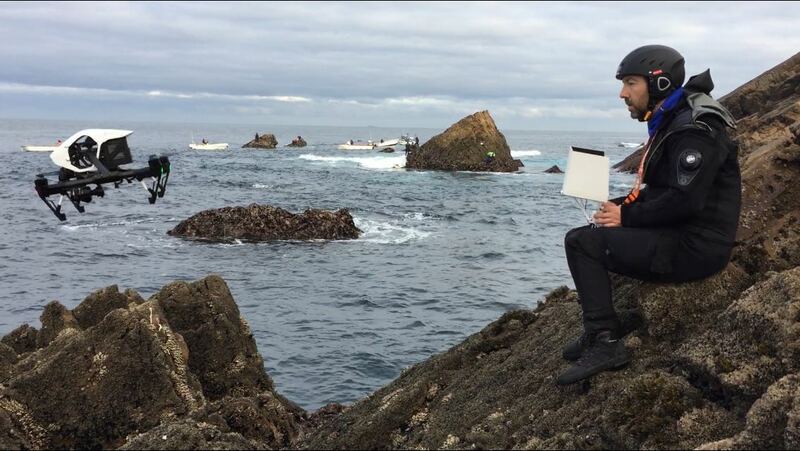 We look forward to sharing the results with administration and fishers. Without their collaboration certainly this project would not have been possible! El invierno ha sido bastante benigno hasta el momento en la costa de Asturias. El buen tiempo durante las Navidades ha asegurado una buena cosecha de percebes, que se vendieron a precios muy altos. Los precios ahora ya han bajado, pero todavía quedan algunas de las mejores piedras abiertas al marisqueo. Abraham y Fran, de la Cofradía de Luanco, han accedido amablemente a llevarnos a la Isla de La Erbosa, un sitio impresionante en el que se pueden encontrar algunos de los mejores percebes de Asturias. Allí hicimos un vuelo de dron para ilustrar un dia de trabajo en éste paisaje impresionante. A la vuelta, Abraham se detuvo en las rocas de “El Corviru”, para recoger percebes para nuestras mediciones de reclutamiento, que usaremos para validar los modelos de transporte larvario. Sin la colaboración de pescadores como Abraham, éste proyecto no sería posible. Jorge Chachero, de DOCUMENTAZUL, opera el drone desde la “Monista de Tierra”. Se pueden ver algunos perceberos en las rocas, y lanchas que los transportan de unas rocas a otras. Perceberos trabajando en “La Corverina”, una roca que pertenece a la zona de extracción de “Las Piedras de la Crianza”. Al fondo, la isla de La Erbosa, situada a 1 Km de Cabo Peñas, en Asturias, Norte de España. Rita Nolasco, from the University of Aveiro, explains some of the intrincate aspects of the biophysical models during the meeting. From left to right: Rita Nolasco, Henrique Queiroga, Jesus Dubert (University of Aveiro), Antonella Rivera and Katja Geiger (University of Oviedo), Gonzalo Macho (University of Vigo), David Mateus (University of Evora) and Elena Ojea (University of Vigo). 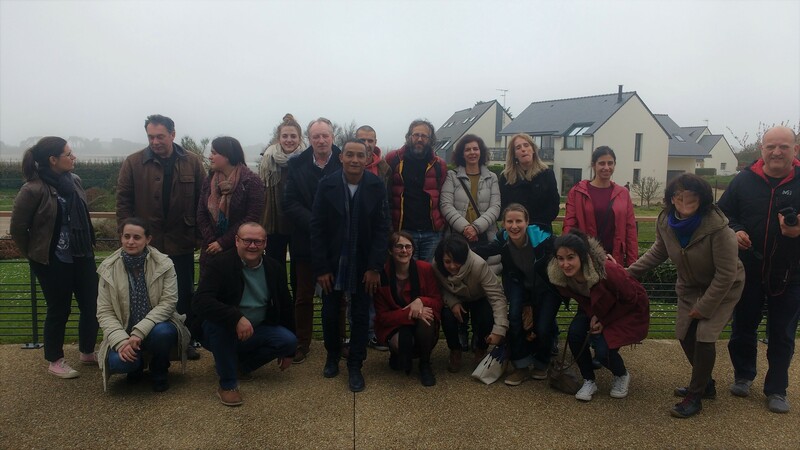 In the meeting there were also Eric Thiebaut (Station Biologique de Roscoff) and Amandine Nicolle (ENSTA Bretagne), who participated through videoconference, as well as Teresa Cruz, Joana Fernandez and David Jacinto (University of Evora) and Elsa Vazquez and Alba Aguión (University of Vigo). During the 29 and 30th of January members of PERCEBES met at the Complexo Interdisciplinar de Ciências Físicas Aplicadas à Nanotecnologia e Oceanografia (CICFANO), in the University of Aveiro, Portugal, to discuss different aspects of the biophysical models of larval transport. One of the aims of project PERCEBES is to develop models to predict the drift of the stalked barnacle larvae during their open water, planktonic life. 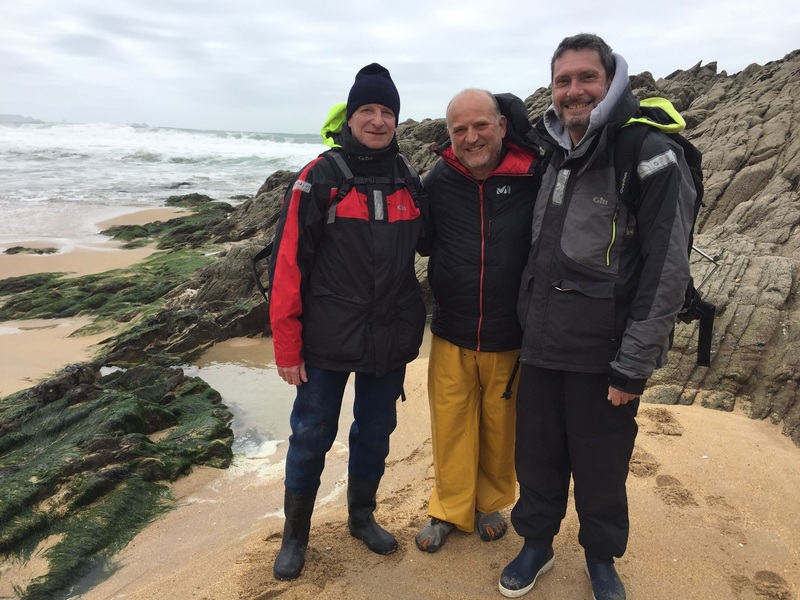 For this, the groups at Aveiro (Portugal) and ENSTA (France) are developing hydrodynamic models that simulate the movement of water in the coast. Once those models are available, we will inject a population of virtual larvae which will behave according to what we know of these animals. This meeting had two purposes. The first was to define the time and space scales of the hydrodynamic model, as well as its resolution. The second was to agree on the characteristics and behaviour of the larvae that will be injected into the model. Some aspects are still unknown or very poorly constrained, thus we needed to reach a consensus based on the best available knowledge, and propose different scenarios. This is a critical step in our way to develop a bioeconomic model, which is one of the two main scientific goals of this project.